• Tube for tank filling. • Tanks from 200 to 1000 lt.
• Low pressure pumps from 60 to 230 lt.
• Mechanical booms from 6 to 15 mt. • Hydraulic booms "X" folding from 12 to 15 mt. • Hydraulic booms side folding from 12 to 21 mt. --(only for 800 and 1000 lt.). 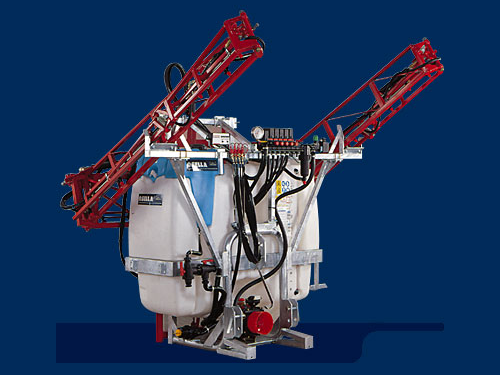 Mixer release, premixer with containers rinsing, mechanical height adjustment, mechanical self-levelling, hydraulic height adjustment, hydraulic self-levelling device (already included on hydraulic booms), foam marker, three-jet ceramic nozzles, tank rinsing kit, electrical control unit for oil and water distribution, computer.